July 2016 was the hand in day for the latest Auckland Quilt Guild mid year challenge. The theme was ‘Carnival’ and the size just 12″ square. I had fun with my carnival mask. 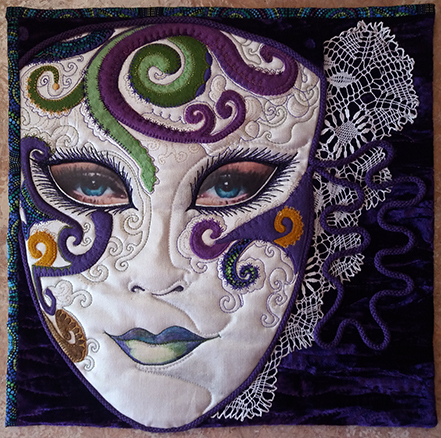 I painted fabric with pearlescent paint and then cut out the eyes of the mask and decorated the mask with more applique, paint and stitching before appliqueing it to the velvet background and slipping in some ‘real’ photograph of eyes. I was happy that it received the Viewer’s Choice award at Festival of Quilt in November 2016.